An Alabama woman is picking through the ruins of a shattered life after her husband died in a tornado blamed for killing 23 people. Dean said she rushed home from her job at Walmart and pressed past sheriff's deputies who tried to keep her away from the area. Her husband's body had been found in a neighbor's yard. She said: "I got to spend a little time with him before they took him away." Dean found her wedding dress among the wreckage of her home Monday and an "I love you" note her husband had received from his daughter. She called him "a loving, giving man." Gov. Brian Kemp says more than 20 homes in Georgia were destroyed by violent weekend storms that crossed the Deep South. Kemp declared a state of emergency Monday for three Georgia counties — Grady, Harris and Talbot — that suffered the worst damage. He told reporters at a news conference that Georgia had "thankfully no fatalities. Most of the injuries are not too bad. So we're blessed by that." Georgia communities were damaged by the same storm system Sunday that spawned an EF-4 tornado in Lee County, Alabama, killing at least 23 people. Numerous tornado warnings were also issued in Georgia, Florida and South Carolina. Kemp said the damage in Georgia likely wasn't severe enough to qualify for federal disaster aid, though it's too soon to know for sure. Rescue crews are using dogs and heat-detecting drones to search for victims of a tornado that's blamed for killing at least 23 people in southeast Alabama. Lee County Sheriff Jay Jones told a news conference Monday that dozens are still missing a day after the giant twister hit the rural Beauregard community, leaving a path of destruction nearly a mile wide. Jones said search crews were "basically using everything we can get our hands on" to comb through wreckage and debris. That includes dogs brought in from across Alabama and neighboring states as well as drones equipped with "infrared capability to detect heat signatures." Jones says the hardest-hit areas have been checked, but the searches are far from over. Alabama Gov. Kay Ivey says President Donald Trump called her cellphone to offer help after deadly tornadoes struck her state and killed at least 23 people. At a Monday news conference, Ivey said Trump called her around 8:15 a.m. She said he told her, "of course you've got my support." Trump has told the Federal Emergency Management Agency to give Alabama "the A Plus treatment." Addressing storm victims in one hard-hit county, Ivey said, "I want you to know I've got your back. We will do everything in our power to help the citizens of Lee County recover." She added, "So to the people of Lee County, please know we are here today to stand with you today, tomorrow and in the weeks ahead. We will stand together and get through this together." A coroner says at least three children are among the 23 dead after at least one tornado devastated part of Alabama. Lee County Coroner Bill Harris said at a Monday afternoon news conference that the children killed were ages 6, 9, and 10. Harris didn't give other details about them. Harris said all but six of the people killed in the storm have been identified, and his office soon will begin contacting families about funeral homes and arrangements. Harris warned that the overall death toll could still increase as searches continue. Sheriff Jay Jones said search crews are still checking addresses of people who have been reported missing. He would not give a number for how many are still missing, but said: "I would say dozens." An Alabama sheriff says the death toll in an area hit hard by at least one tornado remains unchanged at 23, but officials haven't completed their searches. At a Monday afternoon news conference, Lee County Sheriff Jay Jones said: "I am pleased to report we have not recovered any further victims from the areas we have initially searched. But I want to offer the caveat that we have not completed our searches." Officials have said some of the 23 killed were children. It was the deadliest day of tornadoes in the U.S. in nearly six years. A National Weather Service official says a tornado that struck southeastern Alabama was an EF4 twister with wind speeds estimated at 170 mph (274 kph). Meteorologist Chris Darden said at a Monday news conference that the Sunday storm had a path nearly 1 mile (1.6 kilometers) wide, and 24 miles (39 kilometers) long, stretching toward Georgia. He said officials on both sides of the state line are surveying the severe storm's damage. Darden said it was one of several tornadoes that struck southeastern Alabama. He said one in was Macon County. He also said there also was damage from an EF1 storm in Barbour County. The Sunday tornadoes were part of a powerful storm system that also slashed its way across parts of Georgia, South Carolina and Florida. 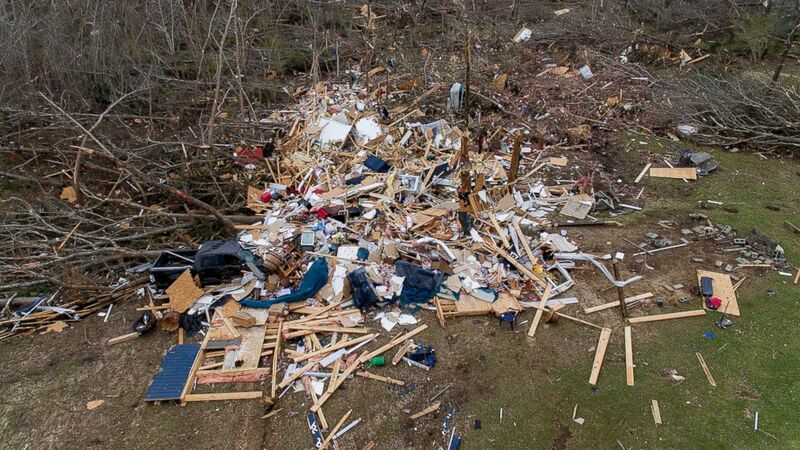 Devastating winds destroyed homes and killed at least 23 people. Friends in eastern Alabama are helping tornado survivors retrieve the scattered pieces of their lives after devastating winds destroyed their homes and killed at least 23 people. In Beauregard, Dax Leandro was helping clean up his buddy's mom's property Monday. Two structures there were obliterated, including the family's house. Debris from the home was scattered in surrounding trees. Leandro was helping look for anything of value to give back to the family. He said some who were inside the house ended up "hundreds of yards away" beneath rubble and yet survived. President Donald Trump says the nation mourns the loss of those who died in a tornado that rampaged through southeast Alabama, killing at least 23 people. Trump says Monday the country is "sending our love and prayers to the incredible people of Alabama." Trump says he has talked to Alabama Gov. Kay Ivey and promised that the Federal Emergency Management Agency will help with recovery efforts and that "whatever we can do, we're doing." Trump commented on the storm before honoring the North Dakota State University football team at a White House ceremony. In a tweet, President Donald Trump says he's told the Federal Emergency Management Agency to give Alabama "the A Plus treatment" as the state responds to a deadly tornado that's killed at least 23 people there. Lee County Sheriff Jay Jones told reporters Monday morning that children are among the dead and the death toll may rise as first responders search the area. A sheriff says the death toll may rise as first responders search the area where a tornado killed at least 23 people in southeastern Alabama. Lee County Sheriff Jay Jones told reporters Monday morning that crews are committed to finding everyone reported missing or possibly trapped in the rubble. More than one child died in the storm, but Jones said he didn't know the exact number. Jones said most of the victims have been identified, but officials are waiting until relatives are notified before releasing their names. About 150 people hunkered down together in a Baptist church and sang songs as deadly storms moved through the Southeast. The State newspaper quotes staff members of the Red Bank Baptist Church in Lexington County, South Carolina, as saying that children sang "Jesus Loves Me" during a regular Sunday night service as storms moved through the central part of the state. One said the group moved from the sanctuary to a long hall during the storm, which knocked a column down in the front of the building and damaged another. Derrec Becker with the South Carolina Emergency Management Division said no deaths or serious injuries have been reported in the state because of the storms. About 8,000 lost power. A strong tornado that was part of the storm system tore through southeast Alabama on Sunday, killing at least 23 people. Authorities plan to resume an intense ground search Monday amid devastation from a deadly tornado that rampaged through southeast Alabama, killing at least 23 people. The number of deaths in hard-hit Lee County was so high that coroner Bill Harris told The Associated Press he had to call in help from the state because there were more bodies than his four-person office can handle. Lee County Sheriff Jay Jones says drones flying overheard equipped with heat-seeking devices had scanned the area for survivors but the dangerous conditions halted the search late Sunday. Jones said the twister traveled straight down a county road in the rural community of Beauregard.